Almost all cookbooks are limited to a number of recipes. In this book however, you will find comprehensive information about the necessary cooking utensils, handy tips and tricks, cooking temperatures and cooking times for dozens and dozens of products and of course also lots of step-by-step recipes for appetizers, for starters and main courses and for delicious desserts. A must have in everyone’s kitchen! 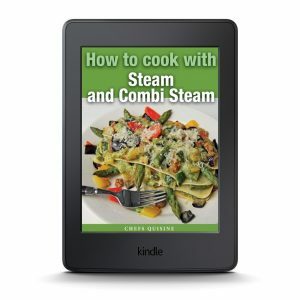 How to cook with Steam and Combi Steam is een Engelstalig e-boek, 188p., aangeboden in geoptimaliseerd Kindle-ebook-formaat. Dit ebook bestaat ook in het Nederlands van dezelfde auteur, met een andere cover en dezelfde kwaliteitsvolle inhoud.